Will Salary Sacrifice Help You? Salary sacrifice (or salary packaging) is where you agree to take part of your wage as a benefit of some kind, equal in value to the salary it is exchanged for. 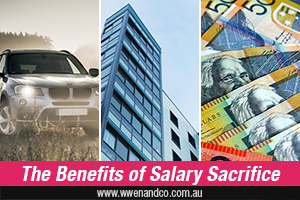 Salary sacrifice can be an excellent way to get a part of your remuneration in a form other than cash – and not personally pay tax on it. The upside of doing this is that your income tax is then based only on the reduced amount of salary your receive. If your employer agrees to go into a salary sacrificing arrangement with you, the benefit you get should, of course, be equal to the GST-exclusive value to the portion of salary that you give up, plus any FBT that is payable by your employer. Options that may be allowed by your employer include a car, shares or payments for your expenses, such as school fees, child care or home internet connection costs for example. There’s little restriction to the sorts of things you can ask for, but while you may have your own wish list, your employer might need to decide whether or not any of them would be impacted by FBT laws. This is a crucial consideration for your employer because while you get the benefit tax-free, the employer has to pay FBT on the value of the benefit. On top of these, one of the most popular ones is salary sacrificing superannuation. FBT-exempt items include mobile phones, tools of your trade, protective clothing and so on. Laptop computers can be exempt within certain limitations, such as a work-only use. Your employer will also need to report certain benefits (known as “reportable fringe benefits”) on your annual tax payment summary where the total value of the reportable fringe benefits (that is, benefits that are subject to tax) provided to you that year exceeds $2,000. Excluded benefits and certain types of non-excluded benefits don’t count. Although it is shown on your income tax return, it will not affect your assessable income or Medicare levy. The total will, however, be used to calculate entitlements to income-tested government support programs or benefits. Topping up your superannuation, in addition to the minimum 9.5% that your employer pays, is a hugely popular option for salary sacrifice arrangements. There are several benefits for going down this path. For starters, any super put away under such a scheme to a complying fund is not considered fringe benefits and is not taxed to your employer as such. A bonus for your employer is that such super contributions also garner them an extra tax deduction (if you are under 75 years). Within limits, super funds only pay tax on these contributions at a rate of 15%, which is probably less than the PAYG rates you would otherwise pay if you received the salary as cash. A super fund also only pays 15% tax on earnings (like interest) from the invested money, which again is probably less than what you’d pay if you earned interest on the money yourself.